Today we took a break from work. After breakfast we went to Valle de Angeles, a town of many, many souvenir shops. We spent a couple of hours walking around, bought a few trinkets, and enjoyed a slightly different perspective. We told our kids not to touch any animals but they really wanted to, obviously! 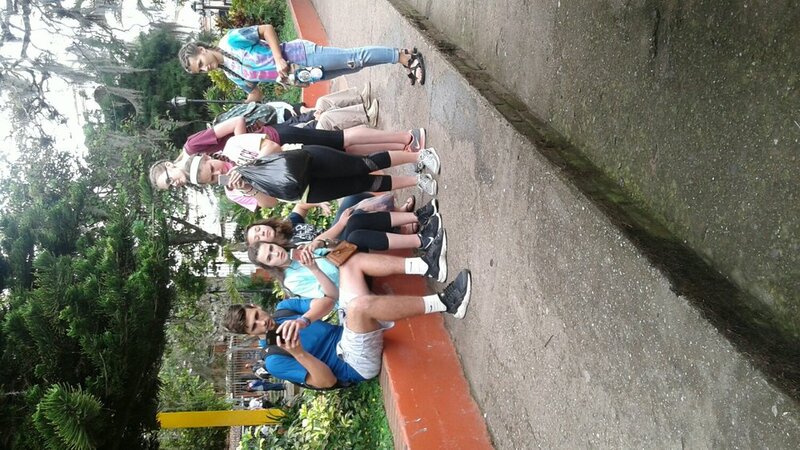 We ate some PB&Js on the bus and then headed back to Tegucigalpa to the Guanacaste church. This is where Noe Perez is an elder. They were having a special day for their kids & Noe wanted our teens to be involved. We helped the kiyds do their crafts and we all taught each other some songs, or tried to. It was a lot of fun and gave us yet another perspective. One little bit grew very attached to Evan in a short amount of time. It was pretty cute. Before we left, Evan asked if I would take their picture together and then a line of 3 other boys asked for their pictures with Evan too! He was a celebrity! We're looking forward to going back tomorrow to worship and have lunch with them. Pictures aren't uploading fully so I'll try to come back later and finish adding them.